I made up a recipe based on things that I’ve had with mussels before – tomatoes and onions, mostly – and added some spice. 1. Heat the oil in a large pan over high heat. 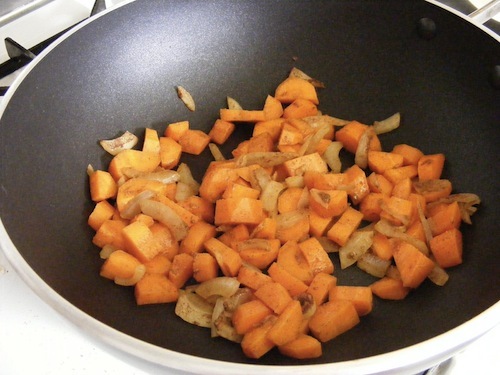 Saute the onions and garlic for 2 – 3 minutes, then add the carrots and saute for another 2 minutes. 2. Add the water and soy sauce and cook until the liquid is reduced by half. Add the tomatoes (plus juices) and let boil, stirring. Mix in the honey, and some salt and pepper. Reduce heat and simmer for 3-4 minutes, uncovered. 3. Clean the mussels and discard any that won’t close when tapped or that have broken shells. 4. Add the mussels to the broth and simmer, covered, for about 6 minutes. You’ll need to shake the pan often so that all the mussels are cooked evenly. Add the parsley and more salt and pepper, to taste. Serve with bread to sop up the broth. Don’t eat the mussels that didn’t open during cooking! 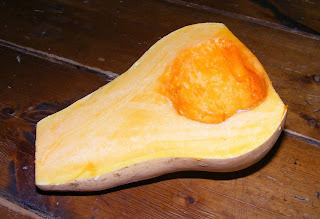 I love squash. So squash fries were the side of the night. I was a little unsure about using squash to make French fries, but they were really fantastic. Definitely should have made more. Peel the squash. 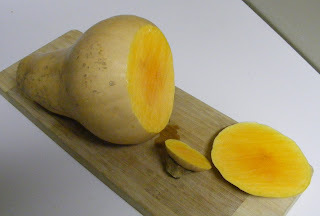 To do this, first cut about half an inch off the top and bottom of the squash.Then cut it in half, top to bottom. Scoop out the seeds. 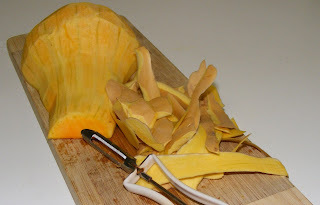 Using a carrot peeler, peel off the outer skin. This is a lot easier than it looks. 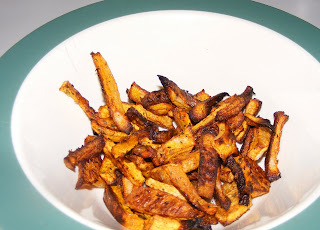 Chop the squash into fry shapes, then mix them in a bowl with oregano and cinnamon. Spray a baking sheet with non-stick spray and spread out the seasoned squash on the sheet. Sprinkle with salt. Bake for 40 minutes, mixing around 1-2 times. Serve with ketchup, maple syrup, or plain! My favorite way to eat these fries is with my homemade (unsweetened) ketchup. I hope you enjoy them! Yesterday I tried a new breakfast recipe: Dutch babies (they’re like pancakes). They passed the taste test, so I made some more this morning. I made two different kinds – one followed the recipe almost exactly; the other is a bit lighter, because that’s how I like things. Ingredients – this serves 2; I halved it. Preheat oven to 400F. Place empty glass pie plate or baking dish in oven to preheat. If you want, you can make individual dutch babies and use regular-size bowls. 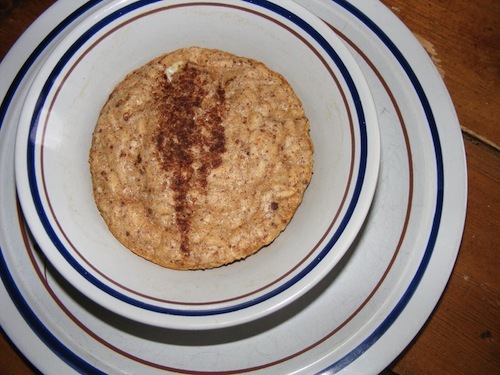 Mix well: eggs, milk, flour, cinnamon, and salt in a bowl. Melt the butter right into the hot dish and pour in the batter. Sprinkle some cinnamon. Bake for 15 – 20 minutes. Cut into wedges. Serve immediately with syrup, butter and dinnamon, Jersey berries, or preserves… or eat it plain! Preheat oven to 400F and warm up the bowls inside. 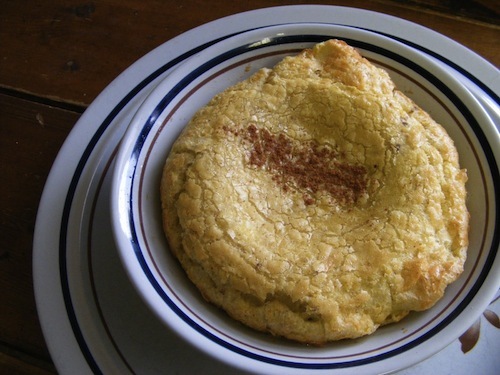 Mix together eggs, milk, puffs, flour, oatmeal, salt, and cinnamon. Melt the butter in the bowls and pour in the batter. Sprinkle cinnamon on top. 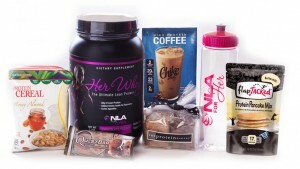 Blogger ate my photos! A pictureless post today. I think this may be my first attempt at Korean cooking. I have to say, it came out very nicely. At our favorite Korean restaurant, one of the Bobby’s favorite dishes is beef Bulgogi. Tonight I decided to do it with shrimp and lots and lots of vegetables. I love vegetables. The bulgogi sauce came out a little thinner than it does at the restaurant (Four Seasons in Ithaca, if you’re interested). But, I think I might be better this way – it’s too gooey at Four Seasons. As for the shrimp, we bought a big bag of frozen ones at Wegmans – precooked and deveined – and they’re incredibly easy to work with. Before you start making the marinade, just take out however many you need and defrost them in cold water. Change the water every time it gets really cold – maybe 2-3 times – and the process will only take about 10 minutes. Just enough time to make your marinade! As always, you can definitely sub the shrimp for something vegetarian – I like using chopped up seitan. Extra firm tofu would also be GREAT, but you might want to make more marinade because it really soaks up the juices. Toast the sesame seeds – I like to do this in the toaster oven, but it’s also easy to broil them in the oven. Just place them on a baking pan and roast for 7-8 minutes. Drain off the liquid of the marinade (there won’t be much). Heat the butter (oil) in a pan over high heat until it’s melted, then add the shrimp and veggies. Saute for 4-5 minutes, or until the marinade caramelizes. Arrange on lettuce leaves and serve with rice. Sprinkle with pepper and sesame seeds. Enjoy 🙂 This recipe for Korean shrimp bulgogi was really easy, but it seems pretty exotic. It’d be great for parties because you can prepare everything beforehand and just toss it on the stove – then it’s ready in 5 minutes. I had this with lunch today – I wanted some comfort food. Spread the apple out on a baking pan and sprinkle with cinnamon. Broil for 7-8 minutes. I did this in the toaster oven – very easy. Heat the butter in a pan over high heat, then saute the onions with the cumin, cinnamon, and salt for about 2 minutes. Add the carrots and the thyme; saute for 3-4 more minutes. Add the water and mustard and reduce heat to low; let simmer for 3-4 more minutes. Blend the carrot mix in a blender – add water if you’d like the soup to be thinner. 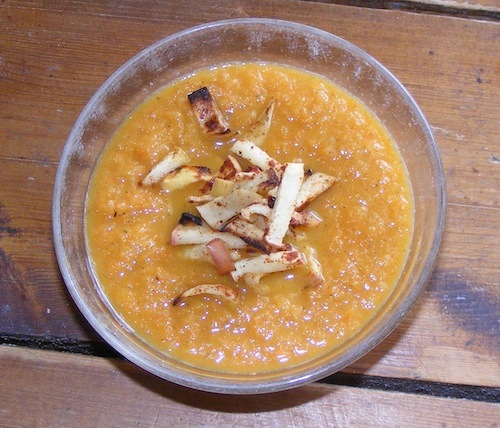 Reheat the soup and mix in the roasted apples; feel free to sprinkle some more cinnamon and salt to taste!